This is the third edition of Shaye J. D. Cohen's important and seminal work on the history and development of Judaism between 164 BCE to 300 CE. Cohen's synthesis of religion, literature, and history offers deep insight into the nature of Judaism at this key period, including the relationship between Jews and Gentiles, the function of Jewish religion in the larger community, and the development of normative Judaism and other Jewish sects. Cohen offers students more than just history, but an understanding of the social and cultural context of Judaism as it developed into the formative period of rabbinic Judaism. This new edition includes a brand-new chapter on the parting of ways between Jews and Christians in the second century CE. From the Maccabees to the Mishnah remains the clearest introduction to the era that shaped Judaism and provided the context for early Christianity. 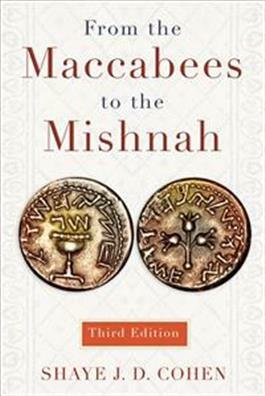 "From the Maccabees to the Mishnah continues to be the essential introduction to ancient Judaism. Its crystalline clarity, absolute command of—and respect for—the facts, and sustained intelligence make it an accessible and important read for everyone from interested lay-people, to undergraduates, to professional scholars. The new chapter, on the separation of Christianity from Judaism, is the most sensible treatment of this controversial topic available." "The term 'classic' is too often abused and overused, but in the case of Shaye J. D. Cohen's From the Maccabees to the Mishnah the term is perfectly appropriate. How many books published in the 1980s are still useful today, let alone continue to remain required reading? It is a cause for celebration that this book is now available to a new generation of readers." "Cohen's 1987 volume was widely acknowledged to be a superb overview of Jewish life in the pivotal era from 200 BCE to 200 CE. This extensively updated and expanded third edition is supplemented by a masterful presentation of a crucial issue that has been debated during the past few decades, namely, Judaism and Christianity's parting of ways in antiquity. The present volume guarantees that Cohen's work will remain indispensable for many years to come."